Welcome to the website of St. Augustine’s Lodge No. 1941 in the Province of Staffordshire. 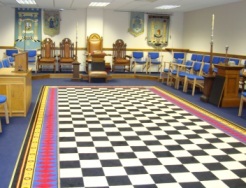 St. Augustine’s Lodge meets on the first Wednesday of the month, October through until June, at the Chase Masonic Centre, Pottal Pool Road in Penkridge. Our Lodge was formed and consecrated in 1882 on the 11th of May, which makes us one of the oldest and most established Lodges in the province. The membership from this time contains many old and established Staffordian names and our Past Masters Register reads like a history book of area families. The first was; Worshipful Brother, The Rev. T. B. Mundy (1882) our present one is Worshipful Brother J. Greer. Our membership is drawn from areas such as Rugeley, Penkridge, Cannock, Hednesford, Birmingham and Stafford itself. Many members travel in from the local villages and hamlets and vary in age from mid 30’s to almost 90 years old. All religions and beliefs are welcome. If you have any questions or are interested in joining St. Augustine’s Lodge, please email secretary@lodge1941.co.uk for further details. Alternatively many of our lodge members will be more than happy to answer any questions that you may have.